Here at Cymbiosis we pride ourselves on our exemplary customer service, which ensures that you get the perfect system for your musical needs. Our aim is to ensure that we help to create the best system for you and your price range.Whether you are looking to upgrade or searching for a brand new system, we will endeavour to make sure you get exactly what you need from your purchase. When you first get in touch, we will be interested to know about your existing system in order to give you the appropriate advice on how to get the best out of your current system and to suggest the most effective upgrade path to meet your needs and budget. Your time is important to us and therefore we advise everyone to email or call to book for a demonstration with us. Contact information can be found via our contact page. Setting up a system that is appropriate for your needs takes time and therefore booking allows us to have everything set up prior to your arrival with an appropriate system. This helps us to give your needs our full attention, meaning that you can make the very best of your time with us. We cannot guarantee that when turning up without an appointment that there will be a demonstration room free, but we will try and accommodate you if we can. We do suggest however that you book an appointment which is exclusively tailored for you. We have two main demonstration rooms which allow you to comfortably sit back and enjoy the music and experience. One room’s main focus is on LP12 systems and other vinyl players, and the other room primarily focuses on digital streaming. Both rooms are extremely adaptive and so can cater for anything you would like to focus on. With 18 LP12s on permanent demonstration this means we can show you the individual benefits of most of the upgrades available. The photo on the right shows the commitment that Cymbiosis has to the demonstration of all the upgrades and servicing possible for the Linn Sondek LP12. 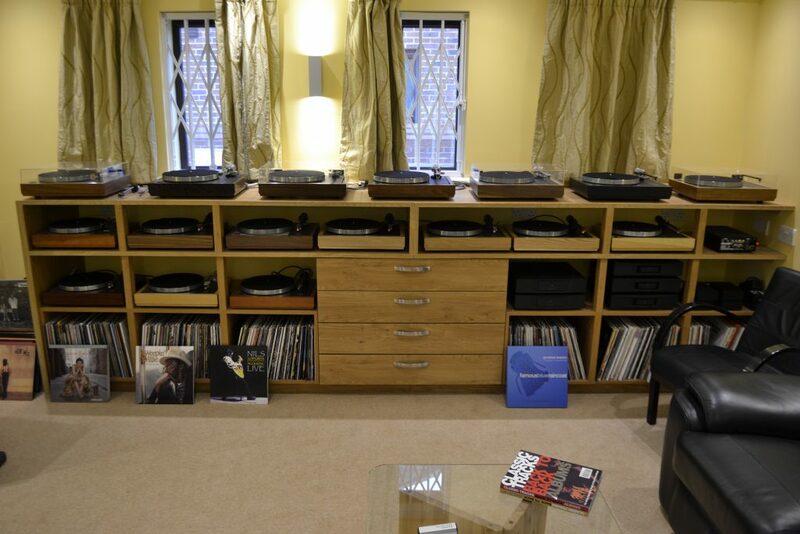 This is a typical selection of LP12 turntables that we have available here for demonstration. This allows us to demonstrate to you the benefits of the various upgrades that are available for the LP12, such as the Keel, Radikal, Urika and Uphorik. You can also audition various power supplies, sub-chassis and arm and cartridge combinations, not only from Linn but also from Naim, Dynavector, Lyra, Hercules, Rubikon and others. Our digital streaming room allows us to demystify this new technology and to show you how it can work in your home with the minimum of fuss. We will also show you the methods required to digitise your music and the ease of use involved to playback the music, listen to internet radio or use available streaming services such as Tidal and Qobuz. The demonstration rooms and indeed all areas of the building are wheelchair accessible, including the toilets. Parking is also available directly outside Cymbiosis including a designated disabled parking space, but if you do require any extra assistance please do not hesitate to get in touch.